chronic condition has no MBS number, it becomes invisible. To support the ALA’s submission for lymphoedema therapy to be allocated its own MBS (Medicare) number. 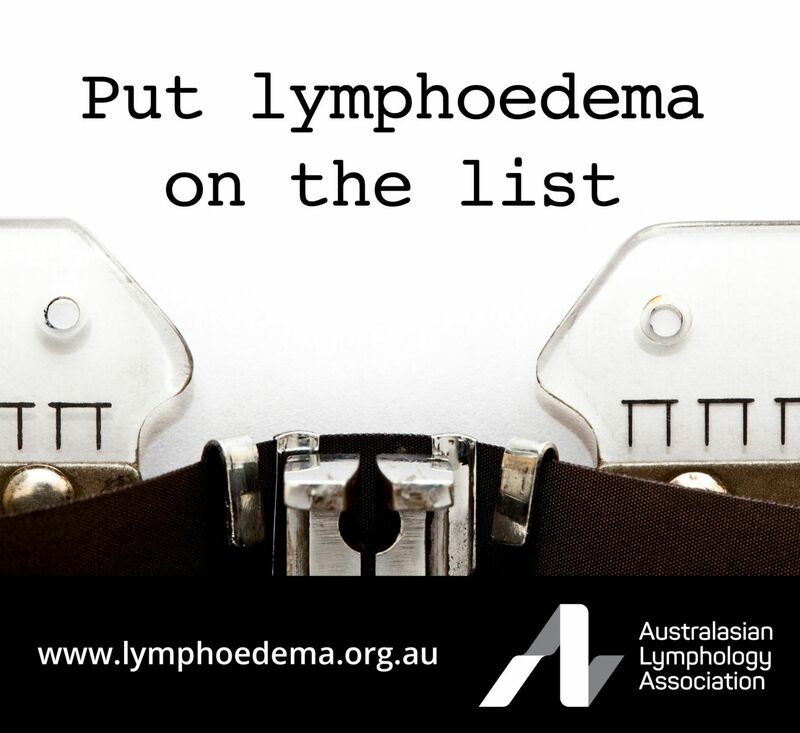 ALA members and the broader lymphoedema community within Australia are being asked to join the letter writing campaign to Put lymphoedema on the list and write a letter to their local federal members. It will make complex lymphoedema therapy (CLT) accessible to a greater proportion of people living with lymphoedema. It will help to improve awareness of lymphoedema, resulting in improved accuracy and timeliness of diagnoses. When lymphoedema acquires an MBS number, governments, the health sector and researchers will better understand the true cost of living with lymphoedema. RE: Lymphoedema therapy accessible for all Australians – Your support is required. How has lymphoedema affected you and your family? What are the costs involved in managing your lymphoedema. If there have been times when you have been unable to access lymphoedema therapy services and garments, describe what impact this has had on you. If you could access more (up to ten per year) Medicare subsidised lymphoedema therapy appointments, what would this mean for you? Include this statement: The Government could easily show support for me and others living with lymphoedema by a minor addition of lymphoedema therapy to the MBS. Ask your local member to advocate to ensure that lymphoedema has its own MBS (Medicare) number i.e. There are Australians in my electorate whose lymphoedema is not being adequately managed due to a lack of support from the Government, but this could be easily and quickly changed via a minor addition to the MBS. Reinforce that correct management of lymphoedema via complex therapy can be expected to reduce the load on other areas of the health system, particularly acute hospital services and visits to GPs. Identify an individual or a group of people in your local community who are unable to access services and explain the impact on them of receiving complex lymphoedema therapy. A handwritten or typed and signed letter has the biggest impact – send it via the post. Use your own words, not someone else’s. Even if your writing skills aren’t the best, a letter written in your own words will carry much more weight. Make it short, respectful and thank them for their service to the community. If you haven’t voted for them, let them know whether you would change your vote if they became a lymphoedema advocate. Follow up your letter with a phone call or a visit to their office. Use no more than three points. Visit www.aph.gov.au/Senators_and_ Members/Members to find your local member. Please note that in Australia during the first two weeks of March, politicians are not sitting in Parliament and are more likely to be in their electorates.